He pitches for at least three innings. Rule 10.19.d.3 has always been a favourite of mine, triggered in often strange circumstances, and sending baseball writers into "When was the last time ___ happened" spins. The role of the closer has significantly changed over time. Whereas the closer used to come in late game in a high leverage situation and then attempt to finish the game, larger and more specialized bullpen usage has generally turned the closer into a 9th inning role only. As the money in baseball has increased, with a seemingly direct relationship to saves, the leverage of a situation has become largely irrelevant and as long as a save is available in the 9th inning, the team's standard closer can be expected to get it. Of Mariano Rivera's 619 saves, only 116 were greater than one inning and only 40 were less than one inning. Zero were three innings or more. Compare that to Dennis Eckersley who only has 390 saves, who had 106 saves of greater than one inning and 53 that were less than one inning. He was brought out when he was needed most. So it's rarely closers now that get 3+ IP saves since it isn't their role. More often than not, these saves come in blowout games when a manager wants to conserve his bullpen. The 5 3+ IP saves this year have been accumulated by Erik Bedard, Drew Smyly, Aaron Loup, Tommy Hunter, and Michael Kirkman. These aren't exactly players that managers are dying to use in high leverage situations. It's why the smallest run differential in any of these games was 4 runs. This is hardly unique, last year the smallest run differential in these instances was 5 runs. 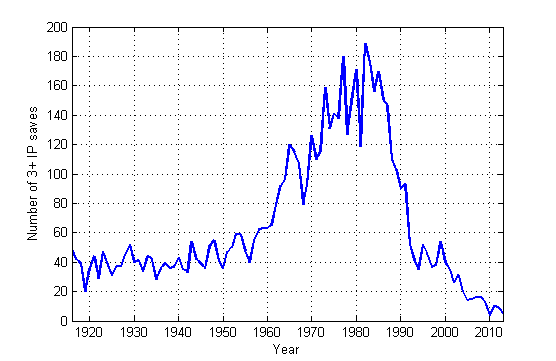 The following graph shows the number of 3+ IP saves each season since 1916. The number peaked in the 70s and 80s when pitchers weren't pitching as deep into games as the early part of the century, but the level of specialization was nothing like what caused the current crash. The relievers of the 70s and 80s pitched as long as they needed to. 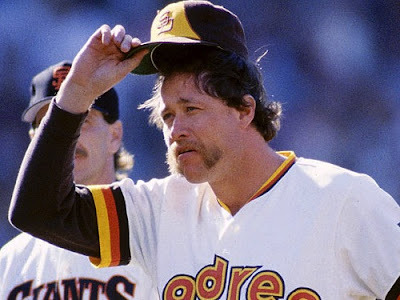 Goose Gossage had 24 3+ IP saves, Pedro Borbon had 27, Roger McDowell had 27, Tug McGraw had 31, Rollie Fingers had 36, Dan Quisenberry had 37, and Gene Garber had 52, one behind the all time leader Hoyt Wilhelm, a knuckleballer. Gene Garber even had 13 saves of 4 innings or more. The crazy part is that even with these ramped up workloads, these pitchers pitched insanely well during these long outings. The top 25 pitchers in number of 3+ IP saves had a 1.06 ERA during those outings, led by Goosage's 0.35 ERA. Even if we consider every 3+ IP save since 1916 the ERA only drops off slightly to 1.14, and no one has ever blown more than 4 saves while pitching 3 or more innings. We probably won't see too many of these saves any time soon. The active leader is Derek Lowe with 9, and he was a former starter and is currently near the end of his career. behind him, Alfredo Aceves is the only other pitcher to even have 3, and he was just optioned down to AAA. So it seems as the 3+ IP save will go down as a relic of baseball lore. From this point on we can only expect to see it in blowout 30-3 games until a manager decides to be a little more inventive.